We fished from noon to 5:30pm w/o a single bite. Bait was everywhere and we could see the Bass on the Sonar machine. Nothing, not even a tap on our live baits. Right around 6pm a good friend called me in on a blitz that was erupting right inshore of where we were set up— just as I was ready to give up until another day. It was as if someone hit a light switch, next thing we know it was total chaos. 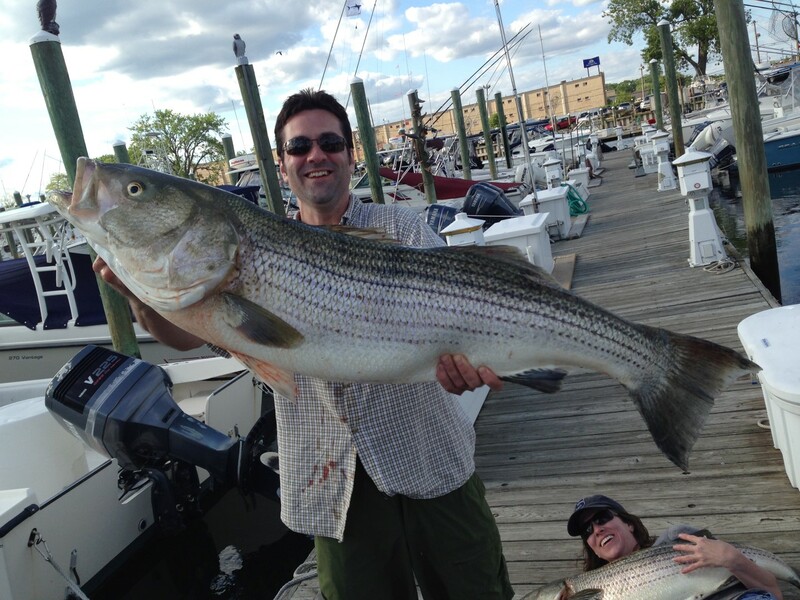 Giant Bluefish, Striped Bass, and who knows what else–the water was exploding and boiling. 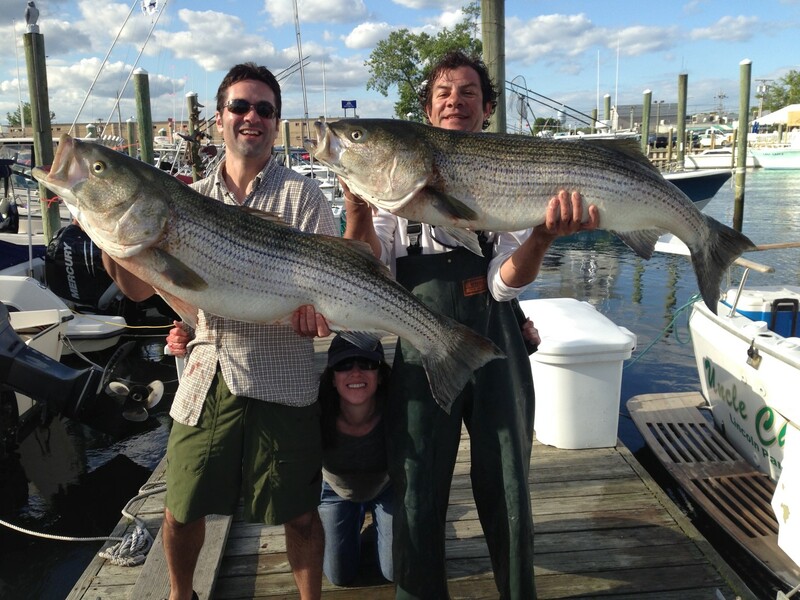 In no less than 10 minutes we boated two absolute monster Striped Bass and got our lines bitten off by Bluefish–and then it was over. We hung around a little while and poked around but that was it, as far as I know they never popped up again. For 10 minutes it was the best damn fishing NJ has to offer, an all out feeding frenzy. Jill and Jake were on the boat for the 2nd time and I guess they bring good luck with them. 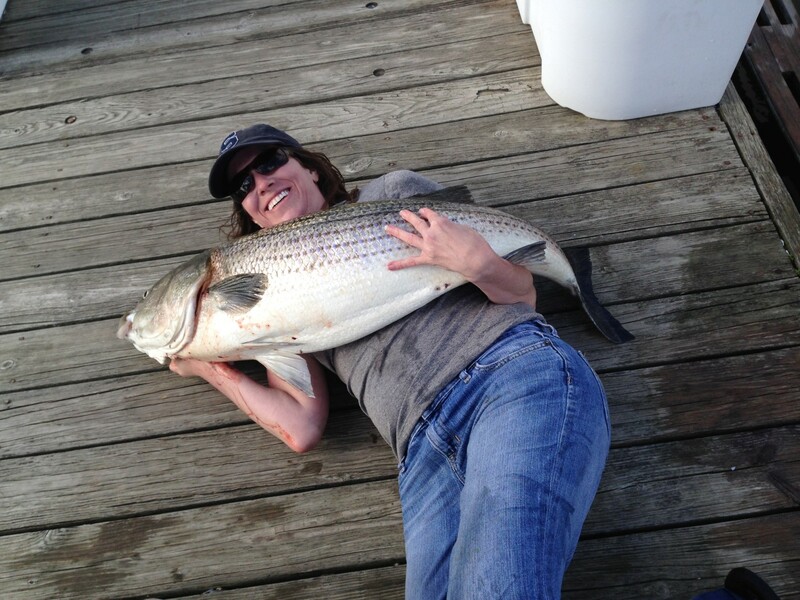 Jill’s fish was so heavy she couldn’t lift it for a photo so she just laid on the dock with it, I helped out for one though. Wild stuff today.